The abdominal muscles of every woman stretch and widen during pregnancy. This is a natural and normal phenomenon. However, it is not normal if the abdominal muscles don’t return to their original position after pregnancy. This condition is known as diastasis recti, or abdominal separation. Various methods are used by health care professionals for diagnosing this condition. Mostly look for 1 to 3 centimeters wide gap in the abdominal muscles for identifying this condition. According to research studies, 35% to 62% of pregnant women experience diastasis recti. Let us find out in detail about abdominal separation and muscle separation post pregnancy. Abdominal separation is normally defined as an opening or space of around 2.7 centimeters or more between the rectus abdominis muscle’s sides. It is not associated with mortality. The space between the left and right rectus abdominis muscles is formed by the extension of linea alba, which is a sheath of connective collagen formed by the internal oblique’s, external obique’s and transverse abdominis’s aponeurosis insertions. Separated stomach muscles normally take place in pregnant women and newborn babies. Seldom, this condition affects men. Diastasis recti normally attacks black and premature newborns, where the abdominal muscles haven’t completely developed and sealed at the mid-line. Separated stomach muscles are caused in postmartum or pregnant women when the rectus abdominis is stretched extensively by the uterus of the women. Multiparous women commonly experience this condition due to frequent episodes of muscle extension. The uterus is often visible bulging through the skin of the pregnant woman if abdominal separation occurs while she is pregnant. Besides, carrying out extensive abdominal exercises and aerobics once the first trimester is over can also result in diastasis recti. Premature babies are often born with abdominal separation. Normally, the gap closes gradually with time. However, there is a chance the condition will return in people with heavy abdomens; people who incorrectly lift weights; pregnant women; and people who incorrectly perform inappropriate and excessive abdominal exercises. Giving birth to multiple babies or a heavy baby. Diastasis recti with a gap of greater than 2.5 centimeters tends to result in health problems. These implications include hernia, pain in the lower back and problematic incontinence tissues that occur due to the relationship of the pelvic floor and the abdominal wall. Mild diastasis refers to the bulging abdomen in postpartum women and cannot be fixed by exercise and diet. To detect abdominal separation, you need to lie flat on your back. Bend your knees and lift your head a little upwards. This little exercise tenses your abdominal muscles and stresses the area below your belly button. Next, move your head slightly forward and tuck your chin right into the chest area. Maintain this position while gently pressing the area below and above your belly button with your fingers. 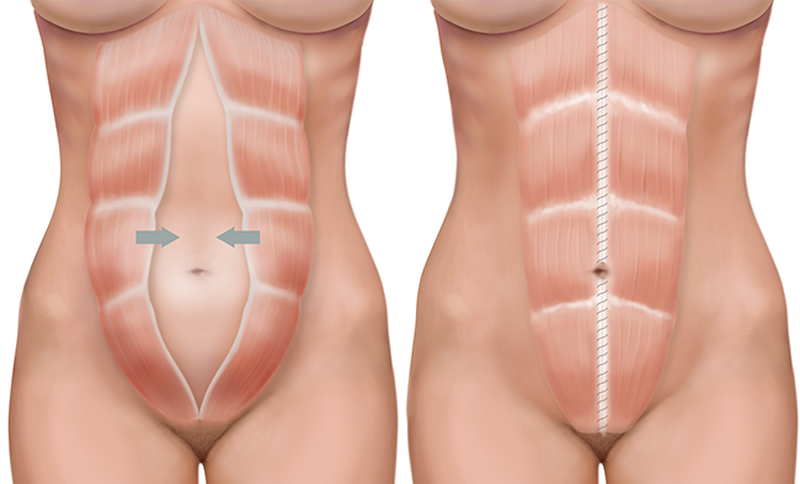 If you feel a bulge or a gap ranging from 1 to 5 centimeters wide, then you have diastasis recti. If you have just given birth, your doctor will be able to detect and diagnose muscle separation post pregnancy. It is normally detected 6 to 8 weeks after giving birth. Normally, diastasis recti heals with time, but you can accelerate the process with the following tips. In case you are concerned about your condition, do consult your doctor. Lie with feet flat and knees bent on an exercise mat. Cross your arms across your naval and pull the side ribs towards your torso’s center with your hands. Press your lower back towards the floor. Inhale and then exhale to lift your chin towards your abs. Make sure to rest your shoulders on the floor. Inhale and then slowly release your head back to the floor. Do it 4 to 8 times a day. Maintain a quadruped pose and relax. Allow your belly to sag a little and then pull it in to tighten the muscles of the mid-section and make sure to straighten your lower back. Maintain the position for 3 to 4 seconds. Relax yourself and repeat. To deal abdominal separation, lie down on your stomach, placing your forearms and elbows on the exercise mat. Lift your entire body to distribute your weight between the toes and forearms. Make sure your back is straight and the belly button is tucked towards the spine. Maintain this posture for about 30 seconds and relax. Repeat it 15 times daily. Lie on your exercise mat with your feet flat and knees bent. Stretch out one leg so it is at a height of 12 inches from the floor. Hold it in that position for 3 to 4 seconds while tightening and drawing in your abdominal muscles. Bend back the leg and repeat this exercise with the other leg. Do it 15 times with each leg. Note: Never execute full sit-ups as they stress your muscles and tend to worsen diastasis recti. After you have given birth, wait for about 4 to 6 weeks to start these exercises. Make sure to not put strain on your abdomen as it can aggravate the condition. You need to take care while lifting anything. Maintain a straight back and bent knees while lifting things as this puts the weight on your legs. Make sure to avoid lifting anything weighty during the first few weeks of giving birth to your baby. Try to sit and walk tall and avoid maintaining a tired slouch in your body. Also, you shouldn’t practice vigorous sit and stand exercises as it is considered as heavy lifting. Additionally, you need to accept that your body will change once you give birth so you need to adjust to a few minor changes. Remember that your body needs 9 months to prepare for delivering your baby, so recovering will take time too. Give your body that time and space. Server responsed at: 04/22/2019 6:06 p.m.